In 2008, Sal Khan had a bright future making millions as a hedge fund manager. He gave it up to produce low-budget math films on YouTube for free. Fortunately, hidden among his millions of loyal students, were the wealthiest of educational philanthropists, Bill Gates and the Google Foundation. Now, with a whole lot of cash and even more street cred, Khan aims to demote the institution of “school” to just one of many educational options. 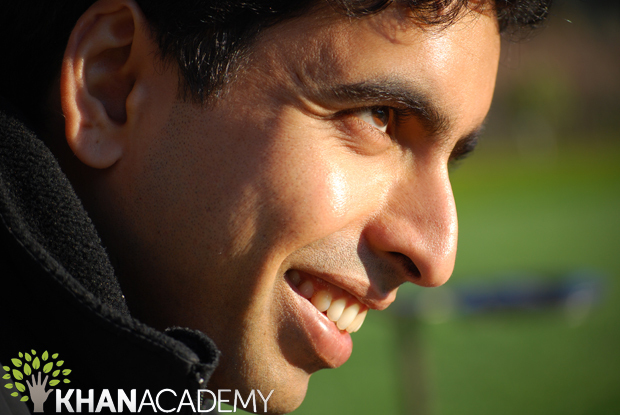 Khan Academy, the YouTube open-course series, began as verbal contract with a 7th-grade girl. His younger cousin, Nadia, was struggling in math class and had agreed to sit in on remote tutoring sessions. After she skyrocketed a few grade levels in ability, more family and friends wanted in on the action, eventually forcing Khan to record the lectures online. Since YouTube encouraged universal access, Khan thought “Why not?,” and made the lectures public, on the off chance someone beyond his immediate friends and family would ever take an interest in his mathematics lectures. The result was shocking, and the audience exploded. To his amazement, the videos were far more popular than his dedicated tutoring sessions. The “first feedback my cousins gave was that they preferred me on YouTube than in person.” Khan’s explanation, which is now the driving philosophy of the Academy, is that the one-size-fits-all lecture approach suffocates students, who learn at different rates and are often embarrassed to ask questions. At home, students can review basic material, repeat lessons, or skip ahead–all without the judging eyes of frustrated peers. Teetering on near desperation, Kahn got a text from his first donor, Ann Doerr, telling him that Bill Gates was talking about the Academy at the prestigious Aspen Ideas Festival–and that Gates used the lessons with his own children! Now, with cash injections from Google and Gates, the Khan Academy is rapidly expanding its offerings, polishing up the user interface and interactive software, and looking to reach a whole new audience. This decision might have been easier for Khan, since, unlike some who enter Wall Street, his decision to become a hedge fund manager was simple fascination with how math and psychology can predict human behavior. Even during his manager days, he looked forward to tutoring his family immediately after work. Had piles of cash and gold-plated shower curtains been the primary driving force, it’s safe to say the Academy never would have existed. Second, lectures would become homework and teacher tutoring would occur during class time. In traditional classrooms “despite the fact that you have 30 humans in the room, it’s a very unhuman experience.” Some of Khan’s devoted following of teachers are already substituting his lectures for their own, and assigning the videos as homework. It saves them time and allows more personalized education during school hours. As thousands of college students graduate with no hope for employment, and the United States continues to lag behind others in math and science, citizens will be seeking some type of change. Perhaps Khan’s proposals are as likely as any. Follow Gregory Ferenstein on Twitter or email him.